This post is part of a series I'm writing about how companies can truly become customer-centric. Subscribe below to get access to the full series. Editor's note: This is the second post in an 11-part series on the HubSpot Customer Code. You can subscribe to the full series here. And the end result of all this attention theft is that customers don’t trust us. Globally, only 3% of people say they trust sales and marketing professionals. That’s two meager percentage points above politicians and car salesman -- ouch! It’s as if people are installing home security on their attention. Earlier this year, the European Union introduced sweeping new legislation, GDPR, to protect consumers from aggressive sales and marketing tactics. People want their governments to protect them from attention theft. Ads that are delightful and entertaining earn our attention. Ads that block and interrupt steal it. Content that informs and helps earns our attention. Distracting clickbait steals it. Forms that ask for information in exchange for high-value education earn our attention. Forms that ask for information in exchange for low-quality content steal it. Emails that ask for permission earn our attention. Emails that show up unrequested (and with no unsubscribe link!) steal it. Sales calls that seek to understand earn our attention. Sales calls that seek to close at all costs steal it. Salespeople and marketers know these things, but the pressure from above to grow bigger, faster, and at all costs is often too intense to put customer needs ahead of business needs. Our team feels this pressure too. HubSpot has long been an advocate for earning attention. Brian and I founded this company on the idea that is it’s better, more effective, and more cost-efficient to attract people with an inbound approach like providing quality content vs. interrupting them with annoying ads. But over the last year we sat down and really examined our practices throughout the customer experience and found some painful areas where we didn’t walk the inbound walk on earning attention. We hired an MBA intern to figure out how frequently we were emailing prospects. In the end they told us it was impossible to tell the average number of emails, but in the process they discovered a few edge cases where some prospects were being emailed as often as 100 times in a week! Sure, these people gave us permission to email them, but there’s no way they anticipated or were asking to get that many. Was anyone on our marketing team trying to be rude? Of course not! We have a team of marketers working hard to hit their goals, and help their colleagues in sales hit theirs. But, it turned out that even with the best intentions, we still weren’t living up to our commitment to solve for the customer. Fixing the problem didn’t happen at the individual level. We didn’t just tell our marketing team to stop sending so many emails, that wouldn’t have fixed much. It took HubSpot leaders making an investment in a customer marketing team and centralizing all customer-facing email. This decision required our leadership team to allocate hours toward solving for the customer–even if it meant delaying lead-generating and revenue-generating work, and restructuring our team and processes. But we didn’t stop there. After a lot of self-reflection we sat down and wrote The Customer Code. We believe that it’s not about what you sell, but how you sell, and The Customer Code holds us to the standard of building a company that customers love. 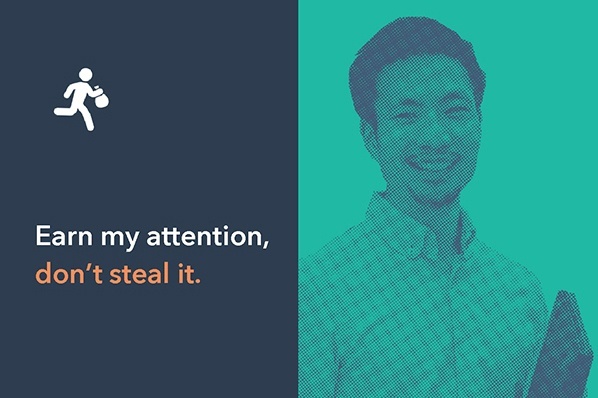 The first tenet of The Customer Code is: Earn my attention, don’t steal it. By improving these things, we create trust with our audience. They like us more. They come back. We’ve earned their attention. And this reduces friction in the customer experience. You can absolutely grow by stealing attention, companies have built massive businesses by doing so, but you grow better by earning it. That’s the kind of growth I’m interested in.